The Vinland map is an interesting artifact, one that captured my attention as a child. Frankly, I think the evidence points to the map being a fake, but there are a some who still fight for it to be real. 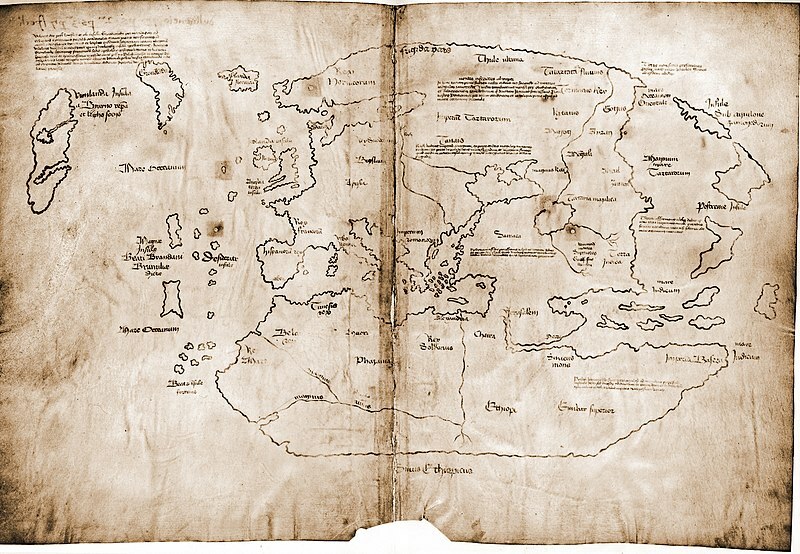 The Vinland map first surface in 1957 glued inside the of the cover of a bound volume of Hystoria Tartarorum (Feder 2006:119, Wiki). Apparently, the book was originaly owned by a Spanish-Italian book dealer named Enzo Ferrajoli de Ry. He hired London book dealer Irving Davis to offer the book to the British Museum. When that offer was refused Ferrajoli sold the volume, for $3,500, to an American dealer Laurence C. Witten II, who offered it to Yale University, who took the book (Wiki). At first, it was dated to around 1440 and people suggested that the map was actually a copy of an earlier map based on Viking knowledge of Canada and Greenland (Feder 2006:119). Yet, even from the beginning there were skeptics. One reason the British Museum had turned down the map when offered was because their Keeper of Manuscripts detected elements of handwriting style not developed until the 19 century (Seaver 2004). Also, map Scholar Douglas McNaughton pointed out that the map was in a style unlike any other 15 Cen map (Feder 2006:119). There was no delineation boarder showing the dived between heaven and earth, the orientation was wrong, and there was no mention of the map in the book in which it was bound (Feder 2006:119). The parchment appeared to have been soaked in some unknown substance that was not able to be tested for and the out line of the map seemed to consist of two separate tracings, one in a feint graphite or ash, the other one more yellowish (Baynes-Cope 1974). This yellow line was of more interest because the black ink used to outline the continents appeared to have a diffused yellow band around it, which was typical for old inks, and normally takes hundreds of years to form. However, under the microscope it was discernible that the yellow line had been drawn on first, then retraced with the black in to mimic the appearance of old ink (Feder 2006:119). Also, there is the appearance that they map was on drawn on a single sheet of paper, but rather two separate pieces (Baynes-Cope 1974). Evidence of this is that several place-names start or finish right before the inner edge of the map instead of being written straight across it (Baynes-Cope 1974). Even the rivers of eastern Europe run parallel to it (Baynes-Cope 1974). In 2005 a team from the Royal Danish Academy of Fine Arts, led by Dr. René Larsen, studied the map and confirmed that the two halves of the map were entirely separate (Larsen and Poulsen 2005). It was suggested that two separate blank leaves in the original “Speculum Historiale”, of which the first dozen or so pages are missing, could have been used to create the map (Seaver 2004). This would explain the chemical treatment of the pages to disguise differences in color and texture, and the noticeable notch in the bottom could have been cut to disguised the slight size difference (Seaver 2004). All of which were common tricks of the fake antique trade. All of this before we even discuss the ink! The ink was instantly a point of contention as it was not conventional iron-gall ink, and didn’t match any known formula available at the time (Baynes-Cope 1974). Also, microscopist Walter McCrone, examined the physical characteristics of the map with a scanning electron microscope and election and ion microprobes (Feder 2006:119). He found the presence of titanium dioxide, the name for a yellow pigment called anatase or titanium white, which was not manufactured until the 1917 and required a knowledge unknown until this time (Feder 2006:119). His conclusions are backed up by a second study and by British researchers Katherine Brown and Robin Clark (Feder 2006:119). Interestingly, this ink is not found on any of the pages of the book (Feder 2006:119). “All the tests that we have done over the past five years — on the materials and other aspects — do not show any signs of forgery” (Acher 2009). He says that his team studied the ink and the wormholes in the document and found that the wormholes were consistent with the book the map is bound in (Acher 2009), which contradicts earlier studies (Feder 2006:119), and that the ink could have gotten it’s traces of anatase from sand that could have been used to dry the ink (Acher 2009). Of course there is no evidence of this and Larsen and his team did not examine the crystals of the anatase to see if it matched up with anatase found in sand. Though it is true that the parchment on which the map is drawn does carbon date to about 1440 (Acher 2009, Borrell 2008, Feder 2006:119), that doesn’t actually mean the drawing of the map itself was made at that time. Clever forgers of the past have used old papers to create the look of authenticity. So why exactly did Larsen change his story? We may never know. Still, the map is an interesting item, though at this point I would guess most scholars don’t believe in it’s real. What’s more important, we don’t need it to be. We have other, very credible evidence of a Viking presence in America long before Columbus. At this point the authenticity of the map is more to do with Yale than with history. 2009 “Vinland Map of America no forgery, expert says”. Reuters.com. Reuters. 17 July 2009. Retrieved February 4, 2013. 1974 “The Scientific Examination of the Vinland Map at the Research Laboratory of the British Museum”.Geographical Journal (The Geographical Journal, Vol. 140, No. 2) 140 (2): 208–211. doi:10.2307/1797077.JSTOR 1797077. 2008 Pre-Columbian Map of North America Could Be Authentic–Or not, Scientific American. July 22 2008. Retrieved February 4, 2013. 2006 Frauds, Myths, and Mysteries: Science and Pseudoscience in Archaeology, 5th ed, McGraw-Hill, New York. NY. 2005 “Report on the Assessment and Survey of the Condition and Technique of the Vinland Map and the Bindings of the Tartar Relation and Speculum Historiale.” Royal Danish Academy of Fine Arts. Retrieved February 4, 2013. 2004 Maps, Myths and Men. Stanford, CA: Stanford University Press. Images provided by Wikimedia Commons, unless otherwise stated. If there is evidence of an 11th century (or earlier) settlement in Newfoundland, why wouldn’t the Vinland map indicate this…there is no island that would be ‘Newfoundland’….? I’m not sure if I understand your question. Are you asking why we don’t know exactly where Newfoundland is according to the Vinland map, or are you questioning the validity of the Vinland map? I just want to clarify. there is evidence of Vikings reaching…and making small encampments on mainland Canada as well as the well documented major settlement in Newfoundland. Why does the map …which I don’t believe to be authentic…..show only one area of land and not an island (newfoundland) as well as some sort of mainland? Doesn’t it make sense that since they were both on the Island and mainland that the map would indicate this.? Well, that’s one of the reasons there are so many questions about the map. Personally, I don’t think it’s real either, for that and other reasons I touched on in the post. But it’s also an old fake map, so these settlements were not known about then. that’s exactly why I think it’s fake. The Vikings would have known…after all they lived there but whoever faked the map could not have known because the settlements were not discovered until the 1960’s.